Visa on arrival is an alternative option to apply for a visa to Vietnam. This kind of visa is picked up at arrival airport and is applicable to travelers coming to Vietnam by air, called Vietnam visa on arrival. Visa on arrival is a special advantage for those who live far from the Vietnam Embassy/Consulate in their countries. The applicants neither have to go to the Embassy nor have to send out the passport. By using this way of getting Vietnam Visa, one only needs at least 2 days for normal processing and 1 day for urgent processing (or only 2 – 4 working hours for super urgent service – see Super Urgent Service) to get a pre-approval letter issued by Vietnam Immigration Department as an official permission allowing the visa applicants to get on flight and get actual visa stamped onto their passports upon arrival at Vietnam international airports. ► Here are full details of How Vietnam visa on arrival works. In this post, we will introduce to you 2 forms required for getting a visa on arrival. The first is the Vietnamese Visa application form (also known as Entry and exit form). This form is required for all travelers to Vietnam, regardless of which kind of visa they get (Vietnam embassy visa, Visa upon arrival or e-visa). Glue a photo 4x6cm at right left corner as the form request + prepare 1 additional photo same size. Prepare 25 USD in cash for a single entry visa. Or prepare 50 USD for 1-3 months multiple entry visa, 95 USD for 6 months multiple entry visa or 135 USD for 1 year multiple entry visa. 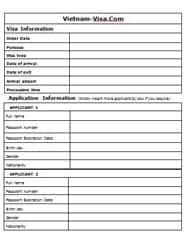 Download this Vietnam visa form in case you do not wish to complete this online Vietnam visa application form. Send the completed form to Sales@Vietnam-visa.com. We will contact with you immediately to handle the visa application for you after receiving Vietnam visa application form. Passport expiration date must be 6 months or more than, if not, you cannot board the flight. In case you wish to do it online, just click the button below.